Drinking an iced chocolate with friends. Perhaps Mace by Coffee Chemistry Signature in Kuala Lumpur should really have a “cafe-art” review rather than a “cafe-physics” review. Indeed, it was because of its latte art that Mace, which operates from a light and airy building in Damansara Uptown, Kuala Lumpur, had been recommended to me. With a comfortable interior and friendly staff, Mace is an interesting place in which to spend some time. But it is certainly the artistic endeavours that are the striking thing about Mace. Nor is it just ‘latte art’. The cakes at Mace arrive at the table decorated into an artwork. It is interesting that every visit to Mace will provide a different creation to enjoy, providing a place that you could return to again and again. Nonetheless, this is a cafe-physics review website and there is also plenty of science to be found in latte art. 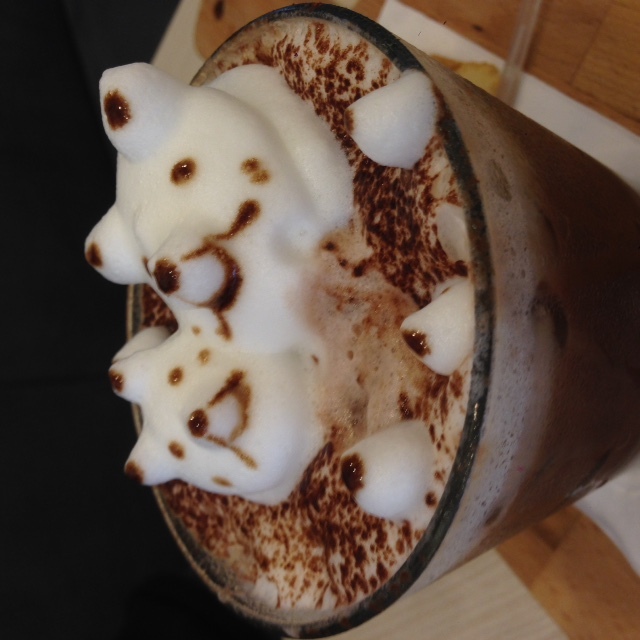 For example, one of our drinks arrived with a 3D latte art sculpture floating on its surface. This piece requires manipulation of the rigidity of the milk foam, a topic that has been covered previously on the Daily Grind. However this time, it may be worth looking a little deeper into our frothy coffee: What makes a bubble? The answer may seem obvious, inside the bubble is “air” with the bubble surfaces being formed from the water and proteins in the milk∗. But it is the question of what air is, and the implications of that, that is today’s Daily Grind. It appears that it was Empedocles (492 – 432 BC) who first recognised that air was a substance†. A thing that existed all around us. But it took until the seventeenth century and the invention of the air pump by Otto von Guericke (1602 – 1686) before people recognised that air was heavy. Guericke was responsible for the spheres of Magdeburg demonstration about the strength of a vacuum. He had fashioned two hemispheres of copper. Each hemisphere fitted very closely to the other. He then used his air pump to pump the air out of the spheres (ie. make a vacuum) and tried to pull the two hemispheres apart. Accounts vary but it is said that teams of 8-15 horses tethered to each hemisphere were unable to pull the spheres apart because of the vacuum created within the spheres†. It was von Guericke’s air pump, together with the work of Boyle on gases and Torricelli’s invention of the barometer that prompted Francesco Lana-Terzi, SJ (1631-1687) to design an ‘air ship’. The idea was simple: If air had a weight and it is possible to make something lighter than air (by making a space inside a copper sphere a vacuum), then it should be possible to make something lighter than air such that it would float, just as objects that are less dense than water float. What differentiates Lana-Terzi’s design from previous fantasies about flight (such as Daedalus and Icarus) was that Lana-Terzi based his ideas on solid principles of mathematics and physics. He calculated how heavy the air was and balanced that with the amount of air that he would have to pump out of four hollow spheres of copper in order that they could lift a gondola full of people. Although there were practical problems with Lana-Terzi’s idea of an air-ship based on four hollow copper spheres, his ideas were correct and eventually led to the development of the hot air balloon. And it is with the hot air balloon that we return to coffee, to Mace and find a connection with a London cafe. The artwork on my cafe latte was not, ‘latte art’ in the sense to which we have recently become accustomed. 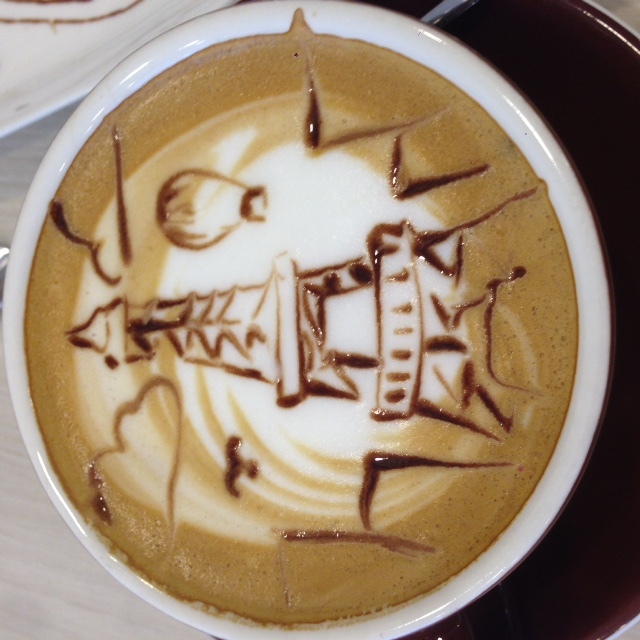 It was however very much art on a latte, with a scene featuring the Eiffel Tower depicted in chocolate. Just to the right of the Eiffel Tower and suspended in the milky sky was a hot air balloon, floating away exactly as Lana-Terzi had envisaged. Back in 1783, on the corner of Euston Road with Tottenham Court Road, there used to be a pub/coffee house called the Adam and Eve. 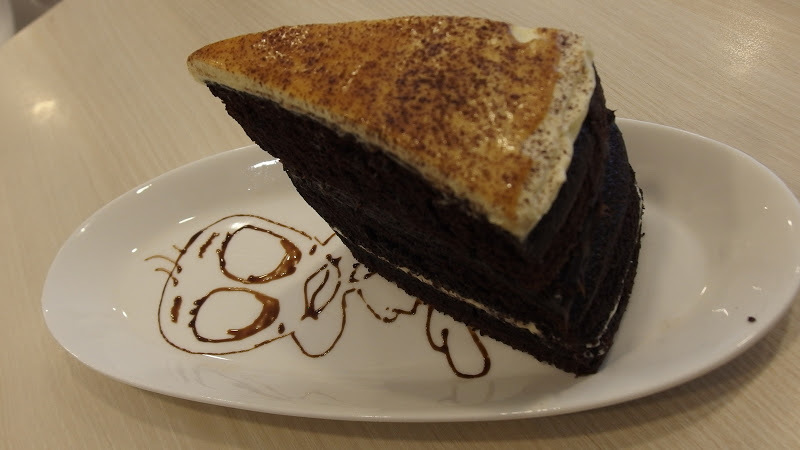 It was renowned for its cakes and cream and its large tea garden. As far as I can work out, the tea gardens extended to around what is now Brock St and the site of a Beany Green. It was here, in 1783 that the balloonist Vincenzo Lunardi (1759-1806) “fell with his burst balloon, and was but slightly injured”‡. Fortunately for Lunardi, and for ballooning in general, it was only a slight setback. Lunardi went on to make a number of balloon flights, including the UK’s first successful hot air balloon flight. So next time you are in Kuala Lumpur, why not spend a while at Mace imagining floating in on Lana-Terzi’s air ship gondola while you enjoy a gorgeously frothy iced chocolate. Who knows, one day Lana-Terzi’s air ship gondola may even feature on their latte art, I’d love to see that picture! Mace by Coffee Chemistry Signature is at Damansara Uptown, Kuala Lumpur.